Saints skipper Tom Wood has been handed an England recall for the upcoming autumn international series. Wood, who has 42 caps to his name, has not played for the Red Rose since Eddie Jones took over, but he has been named in the squad as an injury replacement for Leicester flanker Mike Williams. Teimana Harrison is also in as injury cover, for Wasps back row forward James Haskell, while Dylan Hartley and Courtney Lawes complete the Saints representation. There is no place for props Paul Hill and Kieran Brookes or centre Luther Burrell. The 33 players included in the squad will fly to Portugal on Sunday, October 30 for a week of specific training before returning to England’s base at Pennyhill Park to prepare for the opening game against South Africa at Twickenham Stadium on Saturday, November 12. 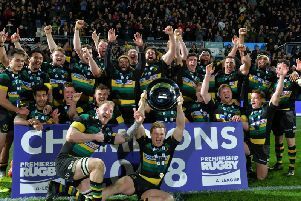 England will then face Fiji, Argentina and Australia on successive weekends, with the clash against the Wallabies coming on the same day as Saints’ Aviva Premiership derby date at Leicester Tigers. “With a number of influential players missing through injury we have two weeks to prepare a robust and resilient team to meet the challenges set for us in the Old Mutual Wealth Series.” said England head coach Jones. “Our training camp in Portugal is a great opportunity to spend a week together, focus on putting our game plans in place and for new players to understand the England way.